ZOALS BESCHREVEN OP FINE LIVING CHANNEL. Dit is een rustig Spaans huis in Mission-stijl op een spectaculaire locatie met een groot privézwembad aan de voet van Santa Barbara. Het heeft een prachtig uitzicht, prachtige zonsondergangen, en een tropische landschap dat een exotisch oord gevoel geeft. Het pand ligt aan het einde van een eigen weg zonder doorgaand verkeer. Dit is een familiehuis van designprofessionals. Met zijn boomhut, zwembad en schommels is het een ideale plek voor gezinnen. Maar als gevolg van de woonwijk het pand is niet geschikt voor luide groepen die willen om te feesten. Mission Santa Barbara is slechts een en een halve mijl afstand. Het is minder dan tien minuten van het centrum van Santa Barbara, die is een zeer geavanceerde stad in de Spaanse koloniale stijl; een prachtige stad om in te lopen. Er zijn theaters, veel bioscopen en het soort restaurants en winkels dat men meestal alleen in grote internationale steden aantreft. Deze artistieke huis is licht, open, en comfortabel. De gecombineerde keuken / eetkamer is groot, 26 voet x 16 voet. De aangrenzende zwembad eetgedeelte is een ideale plek om de zonsondergang te kijken of genieten van een lunch zitten in zwemkleding in de warme zon. De grote woonkamer, 20 voet x 25 voet, heeft een open haard en een prachtig uitzicht op de bergen. Er is een kantoor aan huis en draadloos internet. Niet roken en geen huisdieren, alstublieft. De Santa Barbara Botanic Gardens liggen op loopafstand, net als vele wandelpaden. Trefwoorden: Privé, tropisch, uitzicht, groot zwembad. We loved our say at this unforgettable property. The house is comfortable and the setting unbelievable. Spectacular views in every direction of mountains, ocean, sunsets. Kids loved the treehouse and swings. The owner was friendly and helpful in every way. I would highly recommend this place to anybody. Fun , great views , great house, nicest people you’ll ever rent a house from! Rented the house for the weekend for a wedding. Played golf 15 minutes away at Glen Annie golf club it was excellent. The house was in perfect condition and you couldn’t ask for nicer people to rent a house from ! The property is beautifully manicured, and the views are amazing! My group of friends traveled to SB for a wedding. We had a great time staying in this rental. Some of our days were pretty hot outside, but the house stayed nice and cool using fans and window shades. The house has tons of space for people to spread out. The beds were all comfortable and everyone slept really well each night. The owners were very kind and always accessible if we needed anything, but it never felt like they were on top of us either. It was a great setting for our vacation! We had a wonderful stay at this lovely home. There were 8 of us, 4 adults and 4 children, and there was plenty of room for all. The house had everything we needed and was lovely and clean, it's so charming with lots of history, art work, paintings & sculptures everywhere. The pool is wonderful as are the views from every part of the property. The dining table outside was perfect, as we could admire the views during the day and check out the stars at night. Loads for the kids to do from the pool to the tree house and the swings, they had a wonderful time. 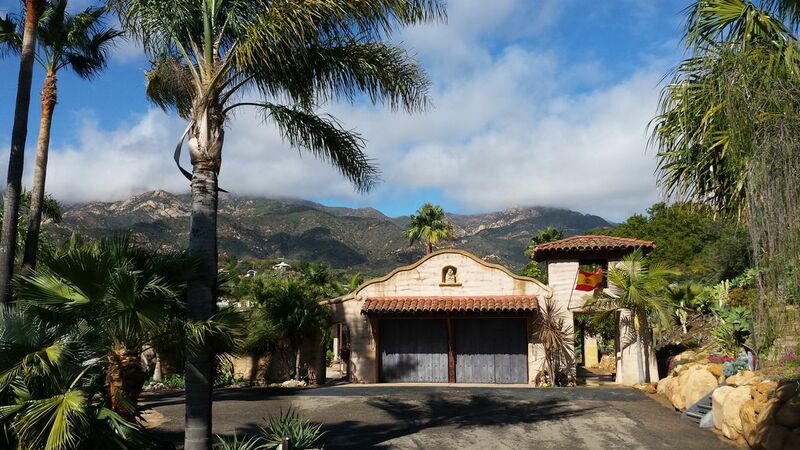 Its a short journey in the car to downtown Santa Barbara and everything else you need. The owners Michael & Hilary were very friendly, helpful and full of interesting stories as well as a local drink before we departed back to the UK! All in all a wonderful holiday. Can't wait to come back again. Gorgeous views and landscaped like a botanical garden. You'll be tempted to spend the whole time by the pool. House interior is not all shiny new stuff, but in excellent condition and filled with curios and art. Super nice owners live just across the driveway. Comfortable stay in beautiful surroundings! I cannot say enough positive things about this vacation rental! The property is simply beautiful, with jaw-dropping views and plenty of space. We had eight adults in the home and there was plenty of room for all. We thoroughly enjoyed the pool and grounds, and found everything we needed in the house. The hosts are very helpful but not intrusive (they live on the property), and we truly felt like guests in their home. Very highly recommended! Special 3 night off-season stay at $597 per night Monthly rates please contact owner. These are the minimum cleaning fees. We request guests to leave the home in a clean and tidy manner otherwise additional cleaning fees may be charged.